Last week, we wrapped up our contest schedule with a sold-out RPS Powerlifting meet, The Memphis Classic. This marks the seventh meet I have been able to help host at NBS and about the 15th I have helped promote and host over the years. If you add in the strongman meets and push pulls, I couldn’t tell you how many contests I have been fortunate enough to experience on the administrative end. Somewhere in the mid-20s, safely. If I am being honest, every event I have ever been involved with felt decently smooth at the end of the day. As you can see, at no point have I thought to myself, “Self, this isn’t your forte…hang it up.” I will say that if I had known then what I know now, I would have absolutely stream lined a few things. But hey, that’s life. If you aren’t embarrassed by your first product, you launched too late (Steve Jobs quote, fyi). This meet was maybe one of the most smooth we have hosted, and I figured I would put together the time line for what has helped us streamline our contest schedule. End of 2016: David and I meet at the end of every year and sketch out our contest schedule. Each year, we aim for 2 powerlifting meets ( a spring and a fall), 1 strongman (during Memphis in May festival), 4 squat-bench-deadlift clinics, and a handful of customer appreciation/ open houses/clinics. This is actually a very delicate process because we try to account for interferences a year out. We don’t want to host meets close to other area meets, and we want enough time to adequately promote each event without clustering the events together. We also have to keep our local calendar in mind: Memphis is the home of MANY festivals. While some play in our favor, I can tell you that no one wants to compete with BBQ fest in terms of attendance. During this time, we also schedule a bit of promotion as to when we will start pushing awareness of each event. Early 2017: We try to post the entries for each meet on their respective federation websites. For powerlifting, this is simple. For strongman, we finalize events/weights and decide what equipment we need to buy to host the show. Around 1 month out, we line up prizes and make sure we have hands on all equipment needed. This means weights/clamps/bars/ monos/strongman equipment/distance markers/etc. 2 weeks out: we finalize staffing for the day. This includes judges/spotters/loaders/front desk/food vendors/table works/etc. 1 day out: weigh ins and set up. These are the longest days I face in a year, but they are really enjoyable. Typically, both David and I arrive to weigh ins 0-15 minutes early and stay until the final weigh in. Typically this is 8am-7pm. At 7pm, we start our set up. 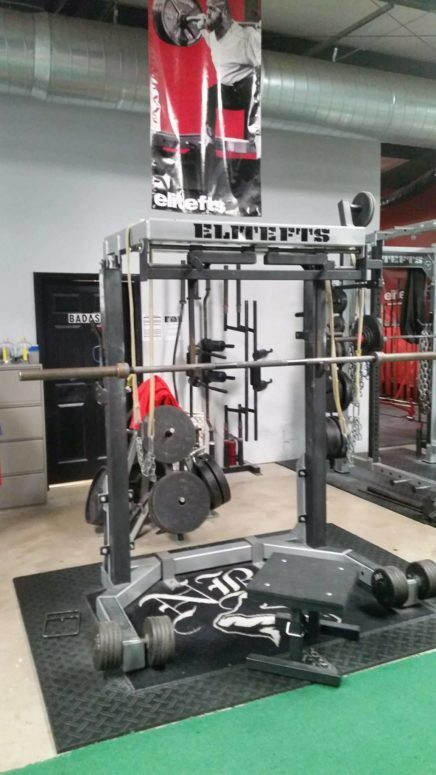 Powerlifting is currently hosted inside NBS fitness, so we spend about an hour moving equipment around and setting up the warm up and main staging areas. We also make sure our projector/computers/barloading/sound equipment is ready to rock. By the time we leave that evening, the scene is set. The day of the meet: we party. Once the meet is over, we spend about an hour putting the gym back together and spot cleaning evidence of the meet. The next day, our staff spends a little time giving the gym extra TLC to wipe away any trace of the previous days events. As I mentioned earlier, this is surely something that has evolved since my very first time working a table or MCing a meet. I’m sure it will evolve further. I appreciate everyone who comes out and competes to even allow such a learning experience, and David for trusting me on the mic.